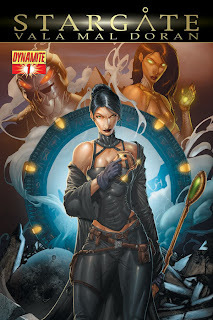 Since Vala Mal Doran is one of my favorite characters, I was a very happy girl when I first caught news that a comic series centered on her was going to be released. I don't think any other characters from SG-1 could be separated for their own stories. As a whole, the cast is interesting but separate? None of them really have enough strengths and/or flaws to carry a story. Vala has these though, and she also has a nefarious past. Plenty of things to pull from, right? The comic doesn't disappoint. We visit one of Vala's many past schemes. Within the first few pages, she shows herself to be resourceful and cunning. She gets herself into trouble, but somehow, she always lands on her feet. That sounds predictable, but it's written in such a way that you always question whether she will actually get away this time. Writer Brandon Jerwa captures the side of Vala that views of SG-1 liked best... or least. In one issue, he's really able to translate many facets of Vala from the screen to paper. You're drawn to her, and though this is awesome, her powerful personality overshadows the story even though it is action-packed. But again, I love Vala, so I don't really mind this. The artist, Cezar Razek, is just perfect for this story. He is able to communicate so much about the characters through body language and slight changes in expression. Without any words, you could see what everyone is thinking. The backgrounds are filled with nice details, so be sure to go back and look twice. My only caveat about this comic: if you're not a fan of SG-1, you're probably not going to fully appreciate it. For example, you're not going to know what a Goa'uld overlord is. The comic book doesn't have much exposition that tells you who Vala is and what her motives are. You can glean the basics - she's a con artist, she's slimy, she's beautiful and uses that to her advantage. But I think the story would have benefited from an introduction that made the comic more accessible to people that didn't watch SG-1. If you like Stargate and especially if you like Vala, you'll love this comic and the rest of the series so far. In the TV show, i am pretty sure she claims never to have slept with someone as a means of manipulation; do they retconn that it the comics? I suppose she could have been lying but it felt like she was being honest. And considering how smart Daniel is, it's hard to imagine getting a lie past him permanently, and i think permanent is what she wanted from him.